Unnews reporters were shocked to hear this intimate pronouncement and wondered how Confucius could possibly know such a thing? Was the great philosopher, after all, just another gay time-traveling Gerontophiliac? For many months the Ayatollahs have been channeling millions of Euros through the Mexican drug cartels to convince Paul to tow the Persian-Ottoman line. And with most establishment candidates claiming to be “Republocrats” (see Rick Sanctimonious, Pitt Chemney, Alfred E. Neuman,et al), one is left to wonder just what makes Ron Paul so “unerectable” – apart from his advanced age and apparently monotonous heterosexuality. Whether Paul might be unable to get-it-up is a mystery best answered by congressional eunuchs, but regardless, he can still be a right-royal pain in the globalist’s arse. The 19 times elected Texas congressman has been opposed to virtually everything the elite are doing to further their goal of One World Government. He was also opposed to TARP and HAARP and even ABBA songs, and he has robotically opposed every stimulus plan that ever crossed the minds of modern political whores. As a pure Republican Ron Paul stood apart from the Republocrats, including Barry Soetoro (D-Kenya), John McCain (R-Vietnam), and Herman Cain (R-Harlam), when he voted against renewing the Patriot Act, which effectively underscores the Neo-Fascist rule of law. It seems Ron Paul's idea of limited government includes limiting the FED’s reach into the crotch of our underwear. On a positive note Paul did vote in favor of repealing the Military’s “Don't Point, Won’t Cry” doctrine, drawing a line in the quick-sand between himself and most of the Republocrats, with the sole exception of the insufferably gay Rick Sanctimonious. Apparently, Rep. Paul believes all Americans have the right to kill in defense of their sexuality. Ron Paul has also come down strongly against foreign AIDS, stating that the entire federal government must take-a-hike before he will even acknowledge their pitiful existence. But the corporate media have twisted this to portray Paul as being anti-Israel - something that makes no sense since he advocates a permanent cure for all AIDS, not just foreign. 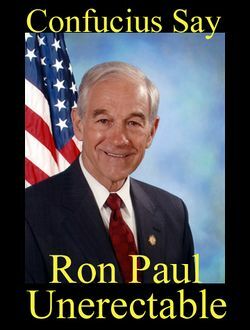 Ron Paul has never voted to increase taxes, and, in fact, Paul never voted for the IRS Act of 1913 in the first place – primarily because he was not born yet. Besides that Paul has never once voted for an unbalanced budget, and he even sets a good example by balancing his own bank statement – a chore that is becoming ever more complicated with the inflow of so much Iranian cash. This page was last edited on 5 June 2012, at 05:46.